Walter Knott's freshly picked berries... blackberries, strawberries, red raspberries, loganberries, especially his extra-sweet Macatawa blackberries... were favorites of my Great Aunts Gertrude (1885 - 1962) and Clara (1888 - 1975). 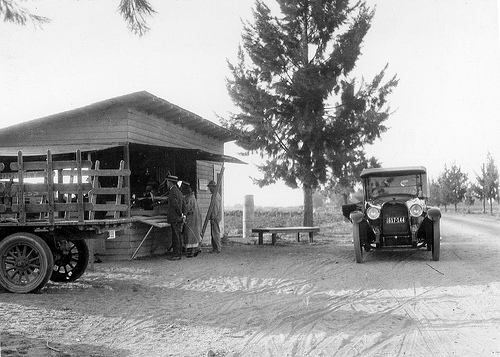 On sunny Saturdays in the early 1920s, they and husbands Gordon and Victor would drive a Model T Ford down eleven miles of dusty roads south from their Whittier homes to Walter and Cordelia Knott's roadside berry stand in Orange County, California. Sunday suppers by the Kansas-born sisters featured homemade preserves and pies vivid with flavors of Knott's berries. 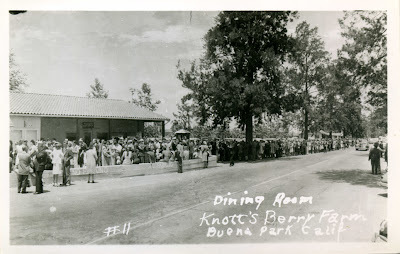 By 1927, the industrious Knott farm employed up to 50 seasonal pickers, and often yielded four crop rotations a year for berries, cherry rhubarb, and asparagus. And Walter had finally persuaded Cordelia to set-up batches of her popular, pure berry jams, jellies, and preserves to sell at the berry stand. Gertrude and Clara, who were busy mothers, housewives, and yearned for travel adventures by car, rarely again made homemade preserves. By 1934, the Tea Room expanded to a 40-seat diner serving fried chicken, mashed potatoes and green beans, plus hot biscuits, berry jams, and berry pies. Three years later, Mrs. Knott's Chicken Dinner Restaurant opened doors with 300-seats and long waiting lines. Today, the famed restaurant draws more than 1.1 million customers a year. Cordelia's jams, jellies, preserves, and her new boysenberry ice cream and pancake syrup became legend, drawing locals and tourists eager to taste and tote home Knott's berry delights. Selling fresh berries fell by the wayside as crowds swelled for Cordelia's fried chicken and country ham dinners. Walter built small amusements to entertain customers while they waited hours to dine: first a rock garden and a replica of George Washington's fireplace, followed by a gift shop and an old Wells Fargo stagecoach. By the 1940s, Walter Knott embarked on rebuilding an American West ghost town, replete with relics from the California Gold Rush. The end result, of course, was Knott's Berry Farm, today a famed 160-acre amusement park with 3.6 million visitors in 2011, and owned by New York Stock Exchange-listed Cedar Fair Entertainment Company. Knott's, though, was built first on Walter's premium berries, and then on Cordelia Knott's extraordinary jams, jellies, and preserves made simply with the finest ingredients. After Walter Knott innovated a new berry in the 1930s, the boysenberry, buyers returned in droves to try the unique fruit. At every meal, my two great aunts, particular midwest-style cooks, always set on the table a pretty jelly dish or two of Knott's boysenberry, red raspberry, blackberry, or strawberry jam alongside a heaping plate of homebaked bread or hot biscuits. As the Knott's Berry Farm franchise grew over decades, gift packs of Knott's top-quality jams and jellies were commonly given to family, friends, and even as company gifts to employees. Knott's products were special, and considered special occasion, gourmet treats. But as of 2013, Knott's superb products are no more. Killed by industrial food mega-corporations, hungry to cheapen and undercut great American products for greater profitability. Big Food corporate fake-food giant Con Agra bought-out Knott's food products and operations in 1995, pledging to foster the high-quality and good reputation of Knott's Berry Farm foods that had pleased generations of Americans. In 2008, though, Con Agra closed Knott's artisan jelly-making plant here in my hometown, and sold Knott's food brands to Ohio-based food giant J.M. Smuckers Co., industrial food corporate owner of Pillsbury, Hungry Jack, Dunkin' Donuts, Jif peanut butter, Crisco shortening, and hundreds of other processed food brands. 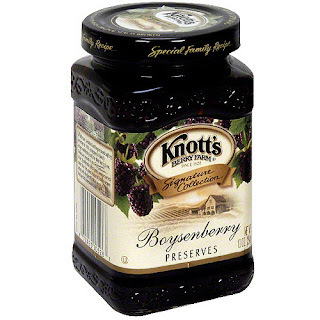 In early 2013, Smuckers announced that Knott's-labeled preserves, jams, and jellies had been discontinued (except for token offerings at the Buena Park theme park). That all Knott's jams, jellies, preserves and related products would bear the name of Smuckers... a move that seems logical, considering that the high-quality ingredients and artisan-attention Cordelia Knott lavished on her pure, homespun fare had long since been compromised in favor of fake food sweeteners, additives, and processes. Great Aunts Gertrude and Clara would be appalled. At their Sunday supper table, they would never have stooped to serve these inferior tasting, processed-food substitutes for Cordelia Knott's fresh, crisp iconic American creations. In honor of their family tradition of delicious, healthy meals made with fresh, high-quality food, I won't either. Sad loss. Another victim of "progress." I have watched the trend from the start of my career in the food business. With every short cut comes a compromise in quality. If you ever have occasion to travel in the South, be sure to eat in an old-fashioned cafeteria where food is cooked from scratch. There are still a few left but they are vanishing slowly, replaced by buffets and ersatz places serving up factory-made products. I know of a few that are left. You might consider Braswell's as a backup. I have always had the same nostalgia for them as a Southerner as you have had for Knotts. I'm not certain if the company is still privately owned but I think it is and the products I notice are now available via Amazon. 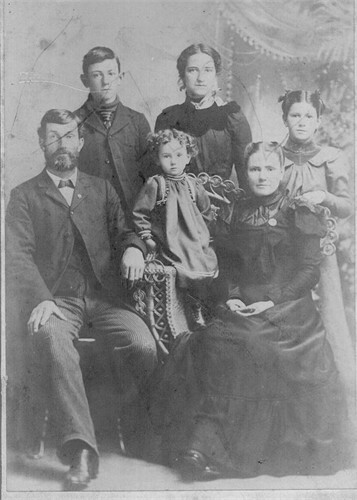 It's an old Southern family that started in the Forties. When I was in the cheese business in the early Seventies I recall getting a sales call from Susie Braswell, a member of the family. Thank you, John, for your suggestion and thoughtful comment. I, indeed, will look-up Braswells. I think the best thing I can do is learn to make my own jams, taking a step back into the past, in honor of Cordelia and all the women like her who took pride in their kitchens and their culinary creations. We all need to talk with our elders and write down family recipes so that we can continue the tradition of cooking real, good food. Thank you for writing about this, even though I feel so very sad to see a California tradition go by the wayside. Even though Smucker's legally will not allow Knott's to buy back the use of the "Knott's Berry Farm" label for their jams and jellies, KBF is forging ahead with the "Berry Market" brand, trying to reclaim the original quality. It's pricey, but seriously good (disclaimer: I work there). Mike, thank you for this comment. Truly good to know that Knott's, via KBF, is attempting to reclaim the quality that once marked their jellies, jams, and preserves, in particular. I still live the in area, and will look forward to hearing and seeing more of the "Berry market" brand. Keep me posted? Thanks again! Great news about the "Berry Market" brand. Thanks Mike for the update (and the honest disclaimer). I'll be there in 3 weeks and will buy! Knott's Berry Farms Boysenberry Pies don't taste right. The berries they use to make the pies had so much favor....not now! I bought the second pie for the year...it just doesn't taste favorable. I guess the snot noses of Corporate America trying to save a buck messed up another tradition!! My name is Joy Knott and ibam related to Walter Knott. What a travesty!!! He would be rolling over in his grave now if he knew what has happened to all of his hard work to build his wonderful empire. I had the pleasure of being invited to family dinners at his house behind the Chicken Restaurant. They took pride in their wonderful products and I was so happy to bear the Knott name. So my husband and I finished the last of a Knotts boysenberry preserves jar today at breakfast. It's label was pre-smuckers 2013. The ingredients were the same as the smuckerized ingredients today in their jars of jam. The scary part is that it was still good after a use by date of June 29th, 2014. Two years later it's still delicious...wow fake sugar goes a long way.